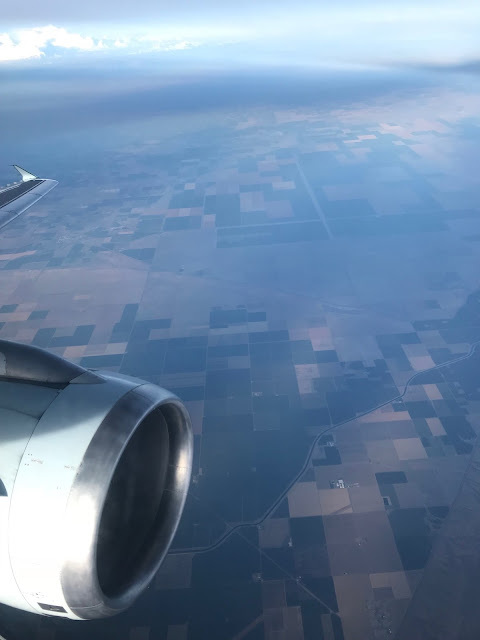 Catching up on a flight review from the summer where the Rewards Canada family once again made our way to Southern California. I have to admit we love it down there and with it being a mere three hours or less by plane from Calgary, we do frequent it quite often. Whether it’s the LA area, San Diego, San Francisco or Palm Springs you can easily get there from Calgary. 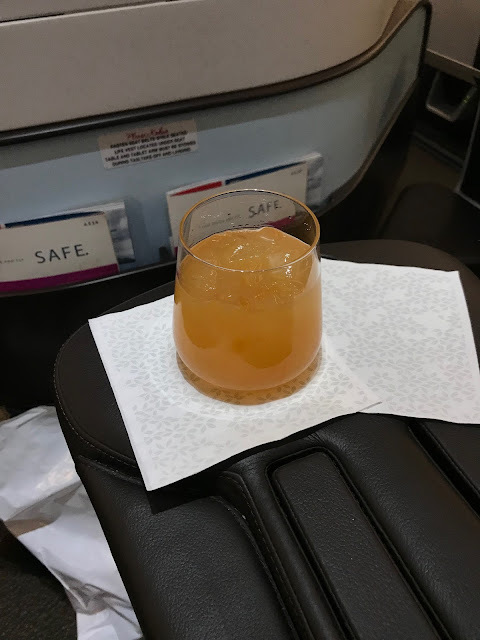 I have to be honest I have lost count how many times we have gone now but it’s been something in the neighborhood of at least a dozen times in the last 4 or so years and lately most of the flights to LAX have been in business class on Air Canada. Why? It usually prices cheaper than WestJet Plus (now called Premium) and each time we’ve booked, the business class fares weren’t much more than Air Canada or WestJet's economy class prices, especially when you factor in seat selection fees, baggage fees, food and drinks that you have to pay for with those economy fares. Such was the case for the flights in this review, there were five of us traveling and all booked into business class for roughly $50 more per person than we would have paid in economy class after you include all the various extras that economy brings. The flight down (AC578) was operated with an older Airbus A320 as is typical for this route. A red alert was literally called just a minute or two before push back as a major storm blew threw and delayed us by over an hour for the departure to LAX. Business class had one seat open on the way down which happened to be the seat beside mine (I was in 4A) and the the other four in our party took up row 3 in front of me. 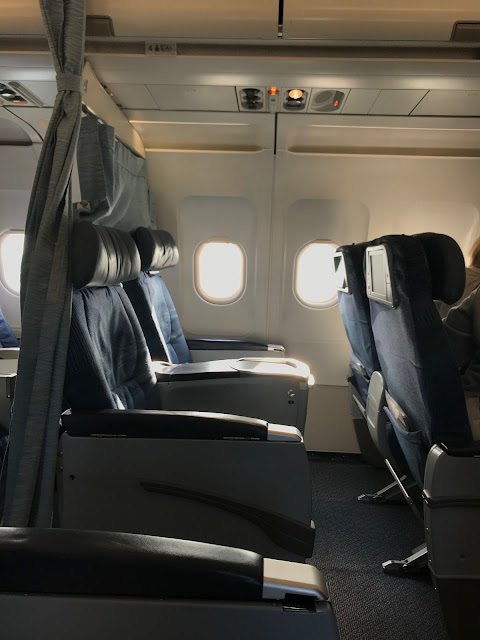 Once in the air the flight was non eventful with great service from flight attendant looking after the business class cabin. This is the menu from the service on AC578 to LAX. I had the cheese tortellini which was pretty good. 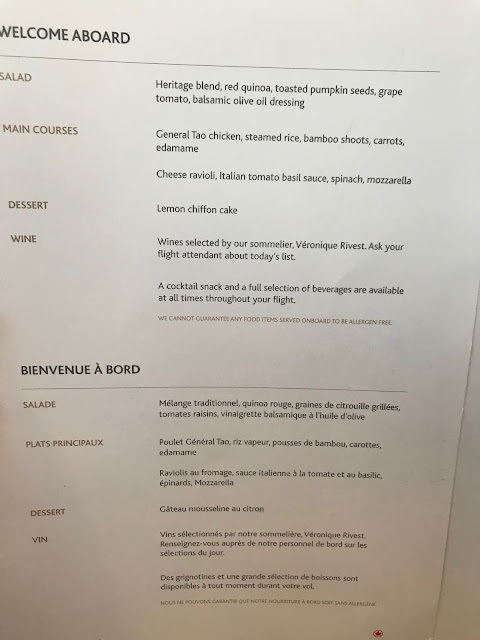 In fact I usually go for this one as the chicken dishes are well, airline chicken dishes. Granted the rest of the family got the chicken and it was edible. 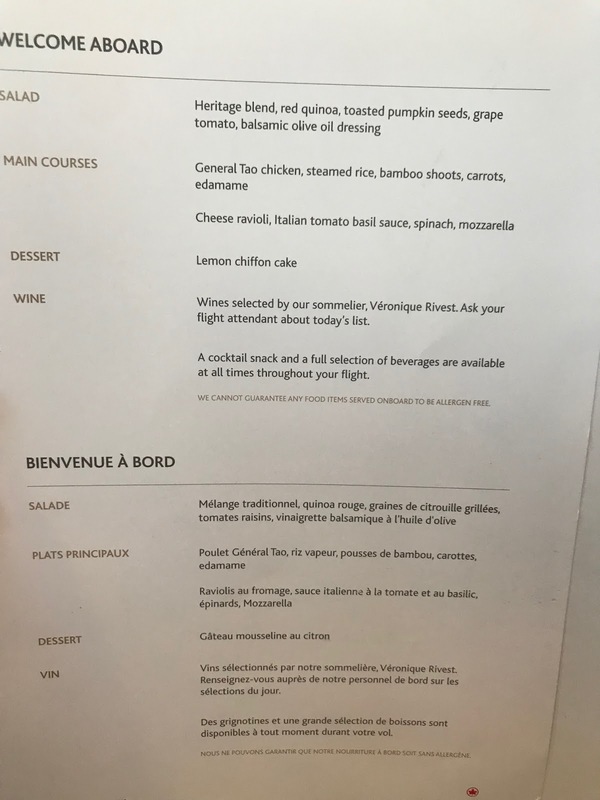 The lemon chiffon cake is a decent dessert while the salad is pretty much the same one with the slight variation on the adder (Feta, seeds etc.) that is seen on these flights. We arrived at LAX about an hour after the scheduled arrival time and the Priority Bag service worked well! All of our bag were in the first batch out on the carousel and we were out catching out Uber probably 25 minutes after arriving. 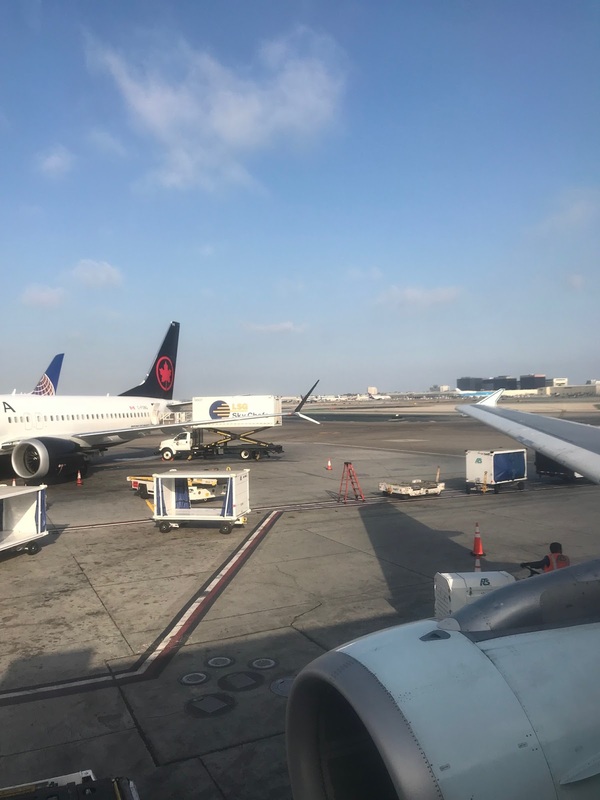 If you haven’t flown Air Canada to/from LAX in sometime you may not be aware that they moved from Terminal 6 from Terminal 2 early in 2017. Terminal 6 isn’t too bad and is comparable to Terminal 2. Dropping our bags off took sometime as the agent was trying to help people who were having some sort of issues. We were second in line in the Priority Check in lane and waited close to half an hour to drop our bags off. Having Nexus and registering our numbers prior to departure meant we had TSA Pre check (including one of travelers who doesn’t have Nexus) and that made clearing security a breeze. There is an Air Canada Maple Leaf lounge here in Terminal 6. The lounge is smaller than the one they had in T2 hence it is no longer accessible to Priority Pass members. You can read my review of this lounge here. Once again I went with the cheese pasta and the others went with the Chicken. All in all the food was pretty good, not stunning, but good. 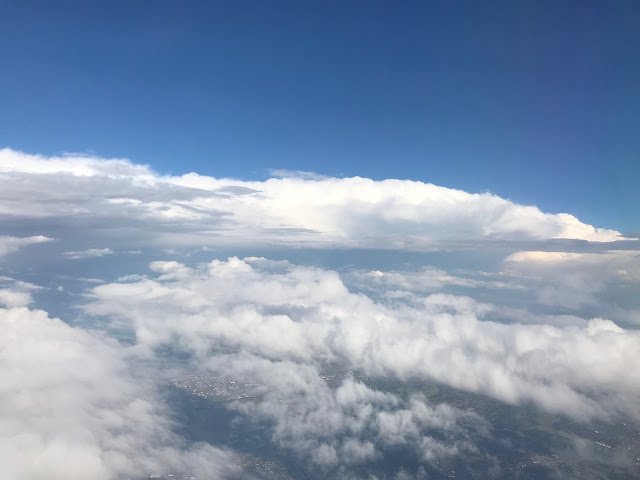 The rest of the return flight was uneventful and easy. 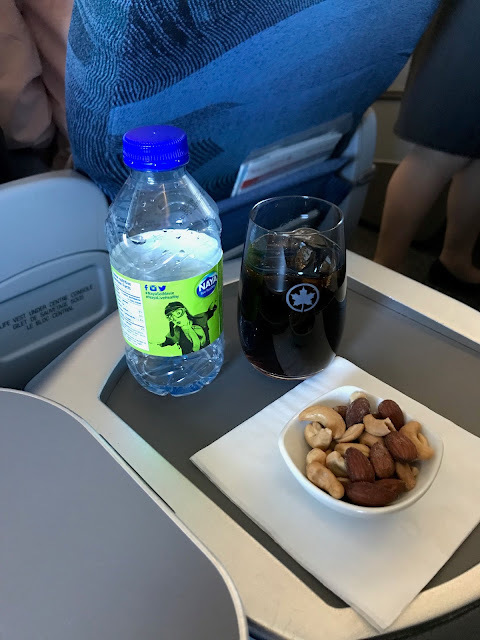 Overall these flights were great as we have normally experience in Air Canada Business Class. We've never really had any issues flying Air Canada, the service has always been good and for the most part things like Priority Baggage has worked in our favour. 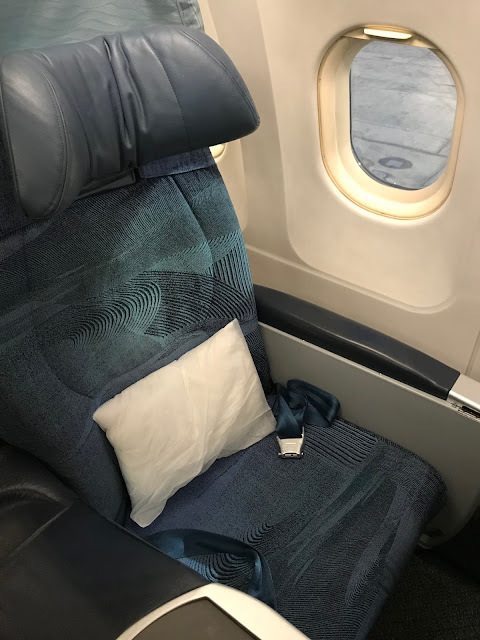 I would definitely recommend people don't look past the little bit extra you may pay for Business Class on these shorter routes as I find it is totally worth it. 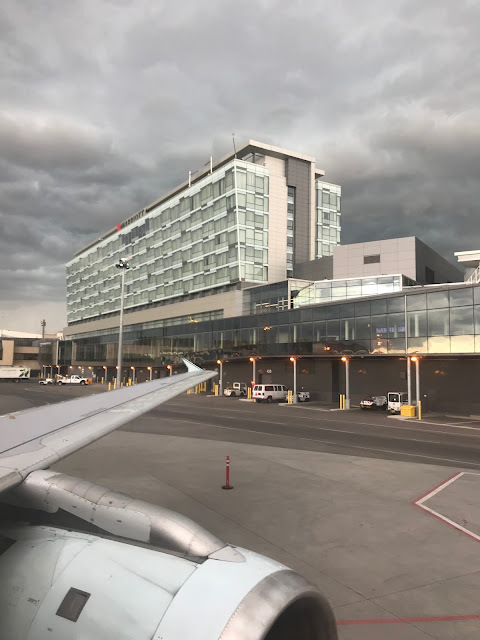 I’m also excited that Air Canada has now launched service from Calgary to Palm Springs and it’s not Rouge - it’s mainline aircraft like the one in this review and that they have replaced Rouge for their flights to Phoenix. Might have to book to one of those cities soon! The flights in this review were purchased on the American Express Gold Card which earns 2 Membership Rewards points per dollar spend on travel which translates to 2 Aeroplan miles per dollar. No other card actually offers this many Aeroplan miles for travel bookings! 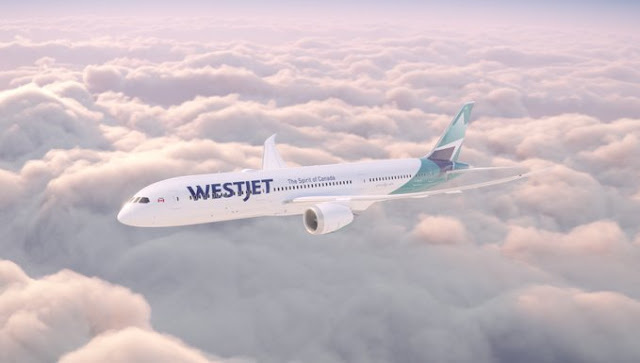 A year and half ago WestJet announced they had ordered Boeing 787 Dreamliners and then five months ago we were introduced to what their 787's will look like on the inside and out. The tickets for the new Boeing 787 long haul flights are now available for purchase and fares from Calgary to London, Dublin and Paris start around C$360 each way for economy class, $1,000 for premium economy and $1,600 for lie flat business class. 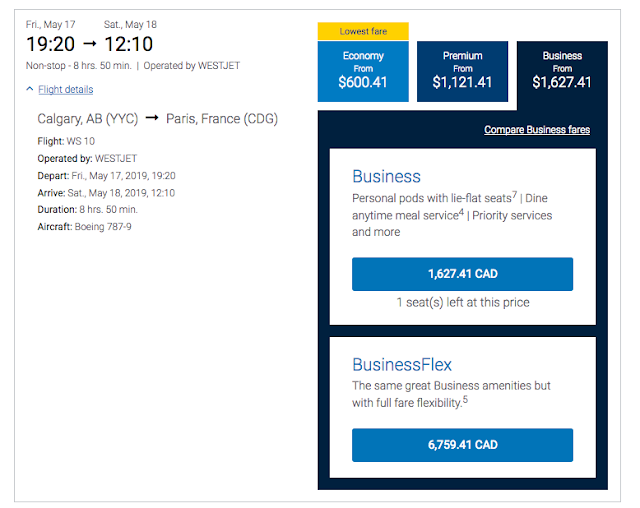 Look at those full fare business class fares though..... Also I couldn't find any low business class fares to LGW in April and May - guess that's based on what AC may be pricing their LHR flights for. Did you guess right for the routes? Are you excited with this announcement? Let us know in the comments section below! The Rewards Canada / iFlyCalgary family has been hitting up Maui for the past 10 years and each time we've gone we have always stayed at the same resort - The Westin Ka'anapali Ocean Resort Villas (read our reviews of that resort here and here) however in April of 2017 Westin opened up a sister resort just north of the KOR Villas and we had to try it out for what would possibly be our last trip to Maui for some time. Double Starpoints, Up to 35% Off and 5th night free for stays in Hawaii, Tahiti or Bora Bora. We used this offer last year as well and when you add up the 5th night free, the 35% off and the value of the double Starpoints it comes in slightly higher than the rate we could have received from Maui Hawaii Vacations (something like $30-$40 per night for this trip). On top of this the trip also gave additional bonus points thanks to other SPG promotions. We booked ourselves a two bedroom resort view villa as that was all that was available at time of booking on Starwood's site. The difference between the Nanea and the older KOR villas is that the Nanea's two and three bedroom villas are true to that. 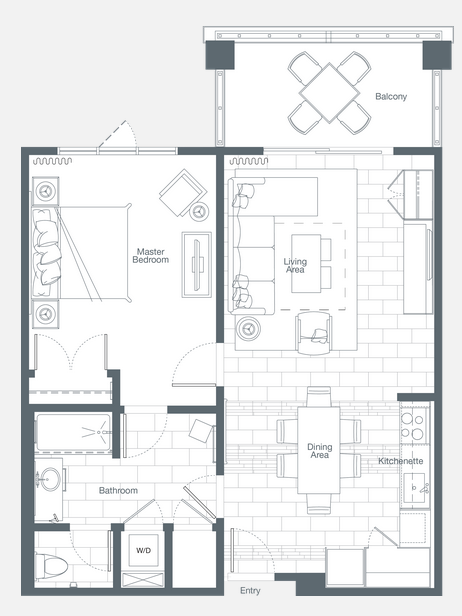 They are not multiple connecting rooms (Studio + 1 bedroom) brought together to make up the two bedroom configuration. 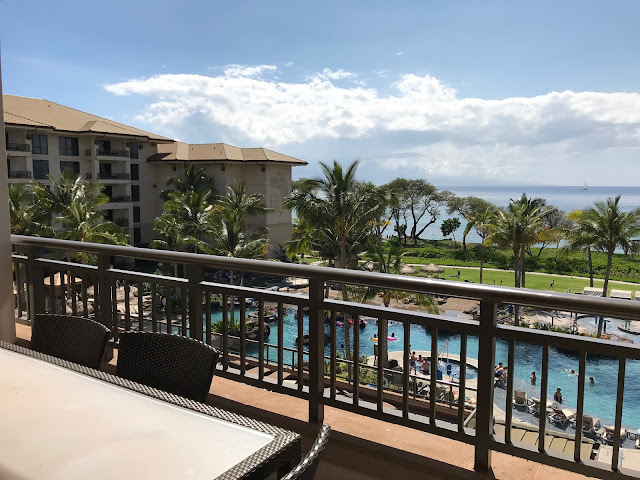 Flying a different route to Maui this time brought us to the island around lunch time instead of the late evening arrival we were accustomed to with Air Canada. Even with picking up our rental car, getting lunch and making the ~40 minute drive to the new villas we were ahead of the regular check-in time of 4pm. We crossed our fingers our villa would be ready at check-in. The check-in area of the new resort is vast and spacious and seeing that we were early there was no one else checking in. 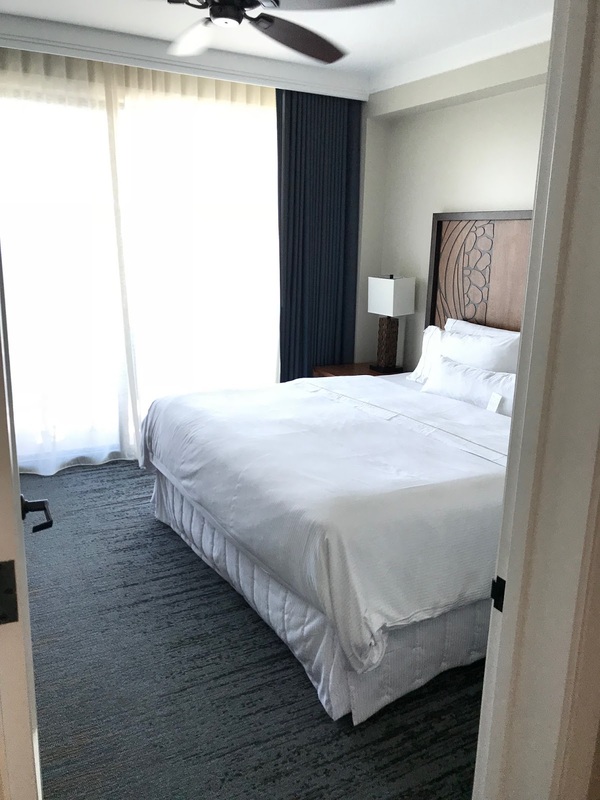 The good news was that our room was ready and the check-in process was smooth with the lady working the desk being super nice and pleasant. The best part was she advised us that thanks to my wife being SPG Platinum that we had been upgraded to a three bedroom ocean front villa! Thank you Platinum status! The new resort is as nice as the older KOR villas and has a lot of the same feeling as the sister resort albeit newer. The villa we were assigned was on the fourth floor of the Hula building and was near some stairs for easy access to the grounds and wasn't too far from the elevators. We were at the hotel just a week before it celebrated its first anniversary and for the most it still feels very new! Sure there's some wear and tear already but nothing disgusting or out of the ordinary for a site of this age and our room was in very good condition. 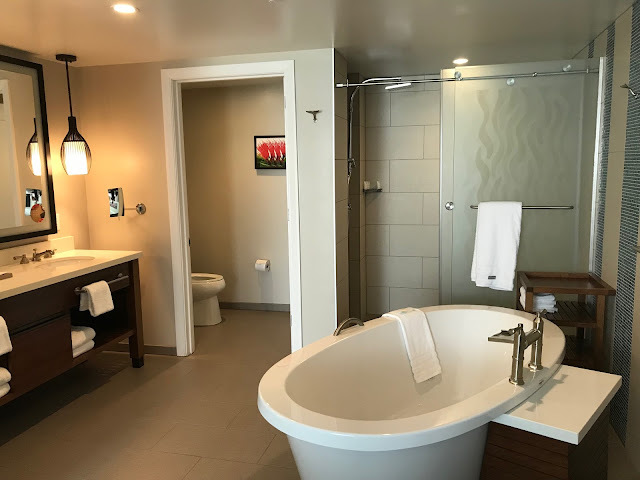 The space in the rooms are ample and they are all nicely appointed. 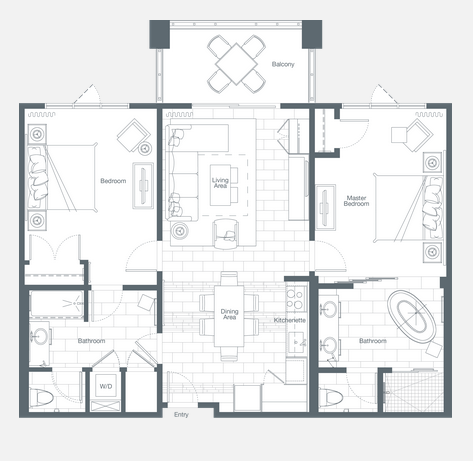 Each villa has a kitchen, one or two bathrooms, washer & dryer and more. Really they have everything you would expect from booking a condo in Maui but the great addition of being a major hotel resort. That's one of the main things that has kept us coming back to these locations is that you get the best of both worlds. 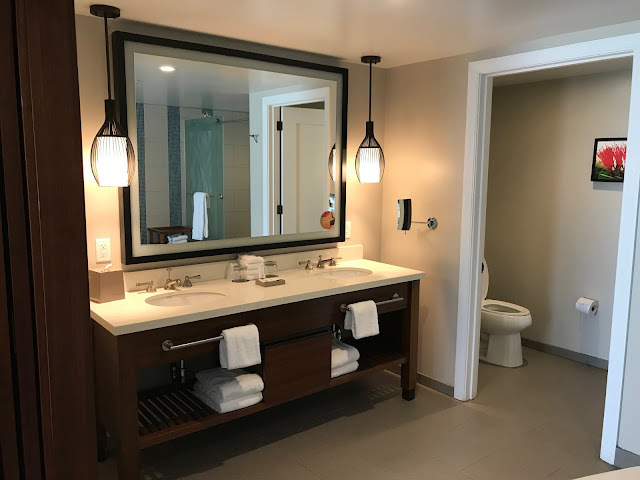 The kitchens are full sized in all the villas (versus Kitchenettes and Kitchens in the KOR Villas) and they have a great ensuite bathroom with separate tub and shower and dual vanity sinks. The beds are Westin Heavenly beds (such nice beds!) and are all king size. All the villas also include a queen size pull out sofa which means you can sleep 4 in a one bedroom, 6 in a two bedroom and 8 in the three bedroom. 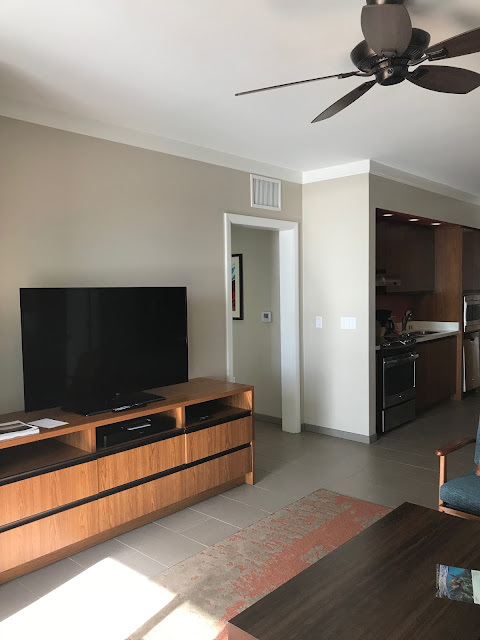 All villas have lanai's with furniture on them, typically two chairs and a table however the bigger the unit you get the more you get on your lanai. As we had the three bedroom our lanai was huge and had a full size table and chairs along with two more chairs with a side table! The lanai extended about 2/3 the length of the full three bedroom villa with access via sliding doors from the living room, the master bedroom smaller of the two additional bedrooms. 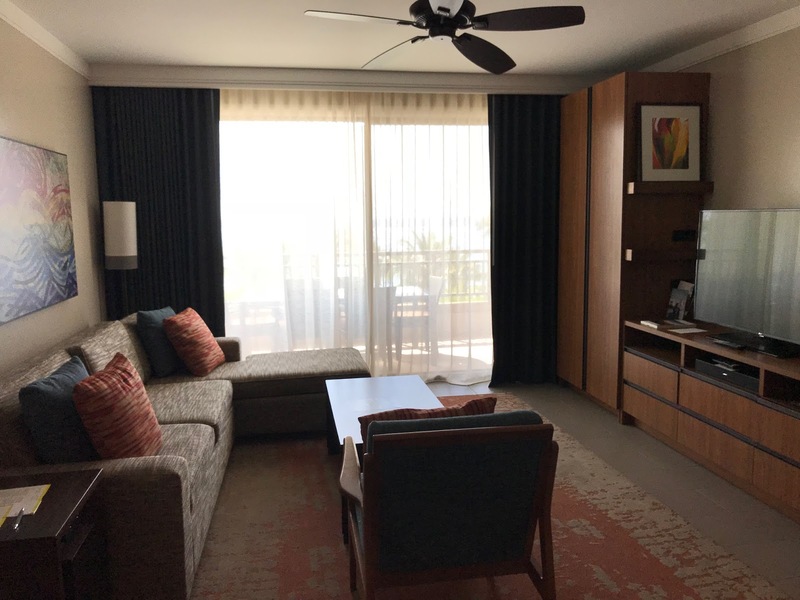 The farthest additional bedroom had a window with the ocean view but the lanai stops short of it. 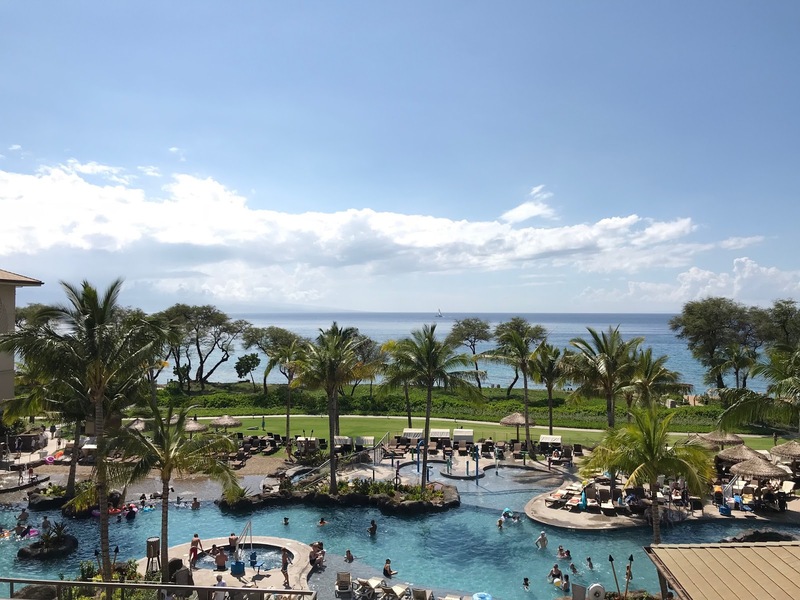 There are also two plunge pools that are set back further to the North side of the resort, those were definitely quieter than the main pool. 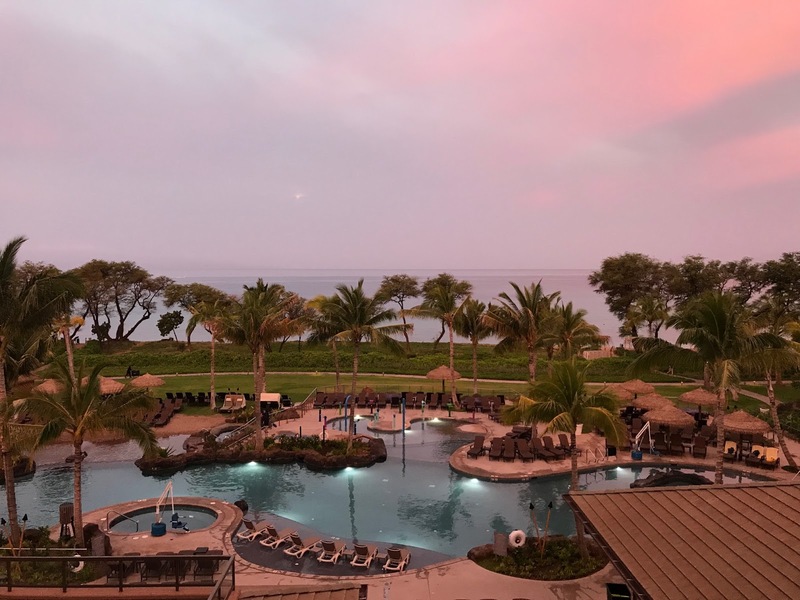 The resort also rents out loungers for use on the beach however they do not rent umbrellas and if you have ever been to Maui it's hard to spend a whole day on the beach without any shade! Knowing that, on the days we did want to spend on the beach we actually went down to the KOR Villas since they do offer umbrellas for rent on the beach. As to food options at the resort there are three. You have Kauhale Market which is resort store that sells a variety of food, has some Starbucks drink options and gifts. Then you have Inu Pool Bar serving all the drinks for around the pool along with a varied menu of appetizers, mains, and desserts. For the most part the drinks from Inu were awesome and a lot of the food was good as well, we did end up ordering food from here on several occasions to enjoy around the pool. Finally the 'fancier' restaurant on site is Mauka Makai. We ate breakfast here one morning to try it out since the rate we booked included a voucher for 35% off all food at Mauka Makai. I have to be completely honest here - it was our worst breakfast on the whole trip. The hashbrowns had a really funky (not a good funky) taste to them - almost as if the oil being used was really old. The buffet items weren't much better. Suffice to say this breakfast turned us off the restaurant so we did not give it a try for dinner, especially with so many good options in Maui! The villas are beautiful and roomy, super comfortable and great to unwind in after a full day in the sun. 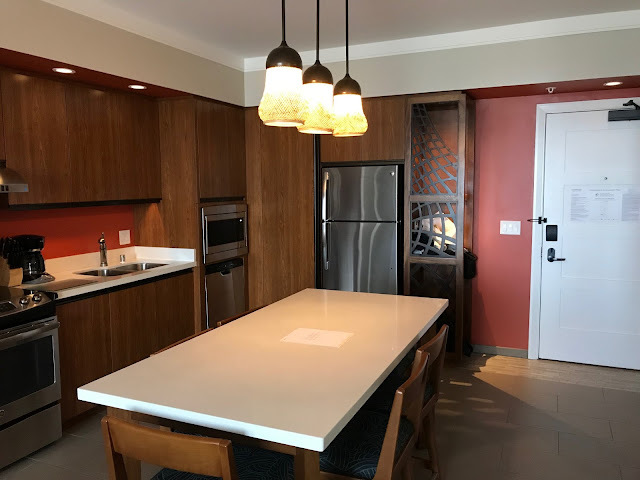 The resort is nice and gives you the best of all worlds with all the features of a condo but being in a resort setting. The service was outstanding from pretty much everyone we interacted with during our trip. What I also loved about this resort is how many towels they give you in the rooms! As you may know from my other hotel reviews a pet peeve of mine is not having enough towels for the number of people in the room. That's not the case here! There are always more than enough towels for everyone. 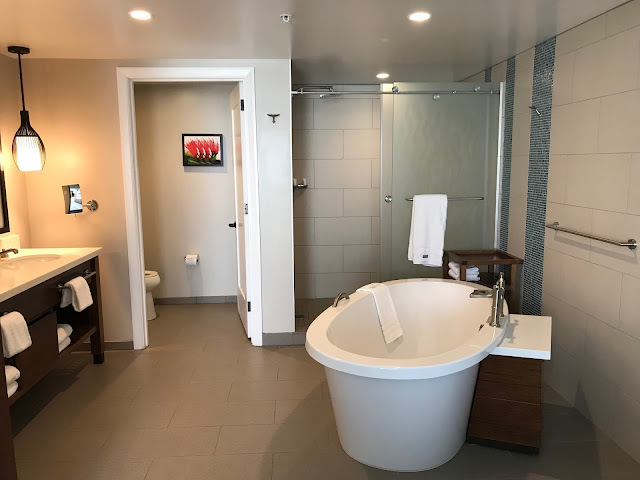 There aren't too many for the Nanea Ocean Villas and are more of my personal opinion with others thinking otherwise. The central pool location is tight and creates a very crowded feel. Some of you may like this and while it looks great and serves its purpose, when you are used to the KOR Villas it it just doesn't seem as enjoyable as the latter. 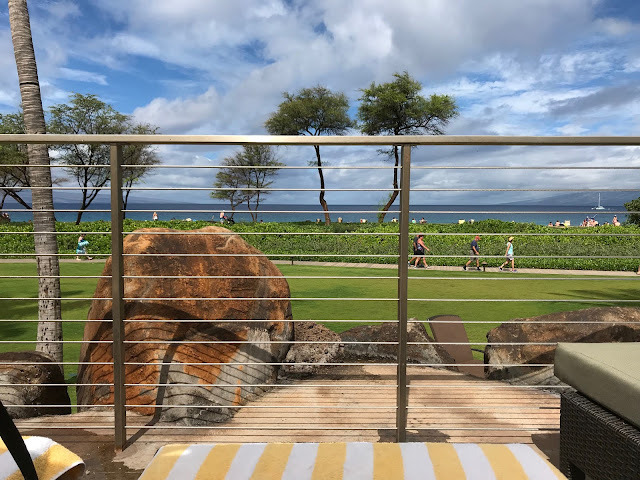 The lack of having umbrellas for rent to use on the beach with the loungers and finally the main restaurant, Mauka Makai, I know we didn't enjoy it and if you look up reviews of it it gets pretty average ratings. That's it for cons! I think we were lucky to be upgraded to three bedroom ocean front villa and it really may be hit and miss for most elites to get one but you should know that most villas, whether they are 2 or 3 bedroom, all look the same and have the same amenities. 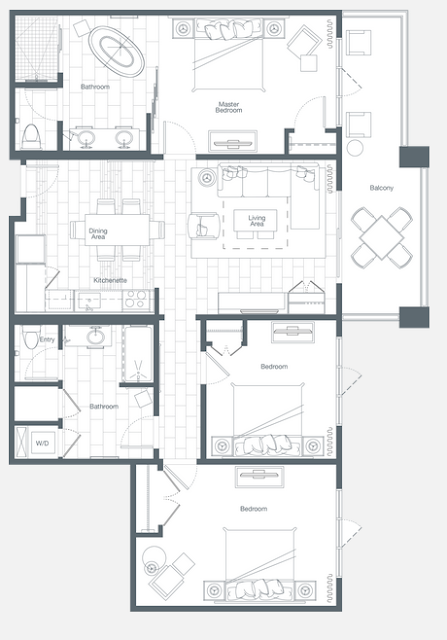 The 1 bedrooms don't have as fancy of ensuite bathroom but should feel similar otherwise. 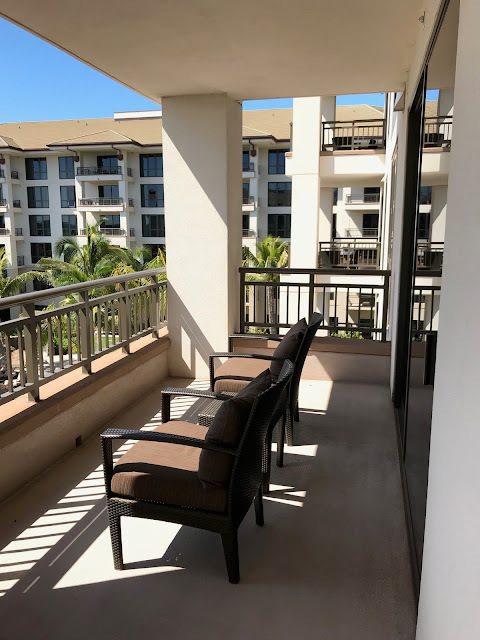 What you may not get is the huge lanai and the view we got. That of course will all depend on what you book and the actual location of the villa you get. 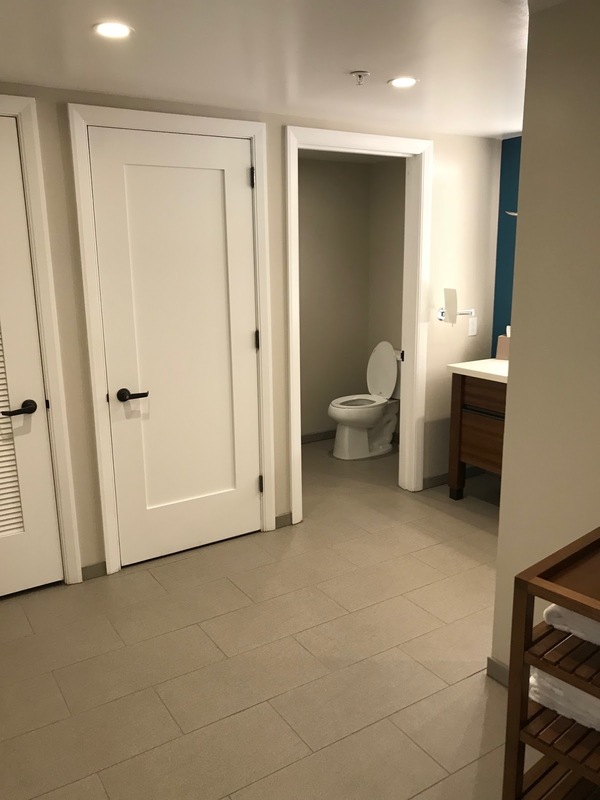 No matter though you shouldn't be disappointed with this resort. 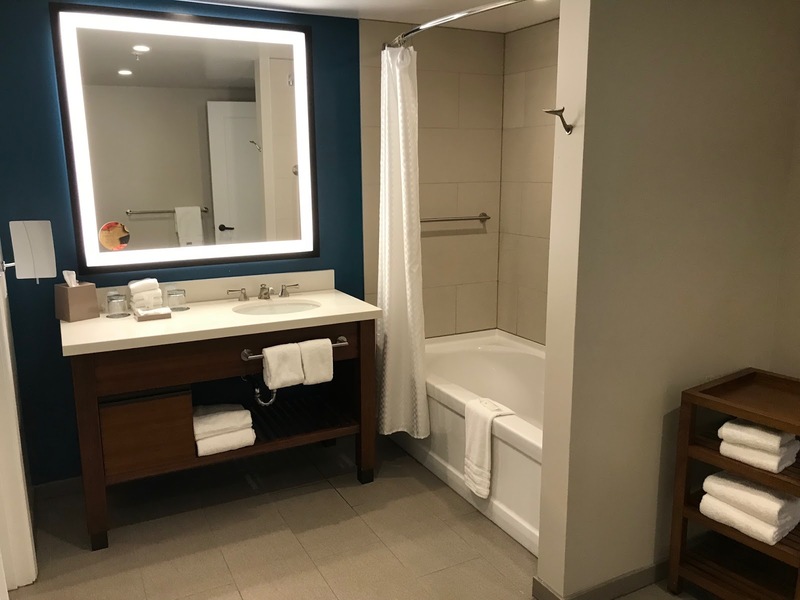 Overall the rooms are fantastic and the service is top notch. 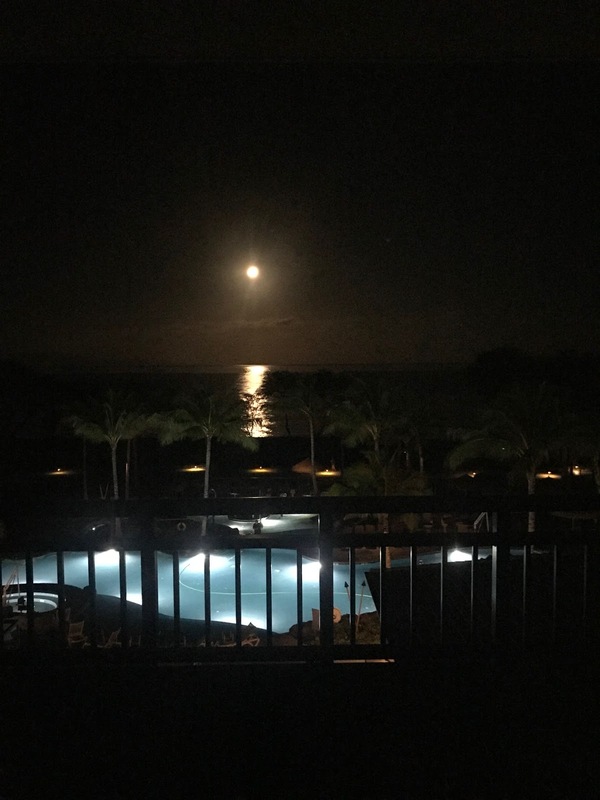 It is a great resort for families, couples, and really anyone else! This resort is most definitely an iFlyCalgary recommended hotel! As you may have already seen we’ve put up areviews for our Easter Trip to Maui and are trying to pump out all the reviews of this trip! 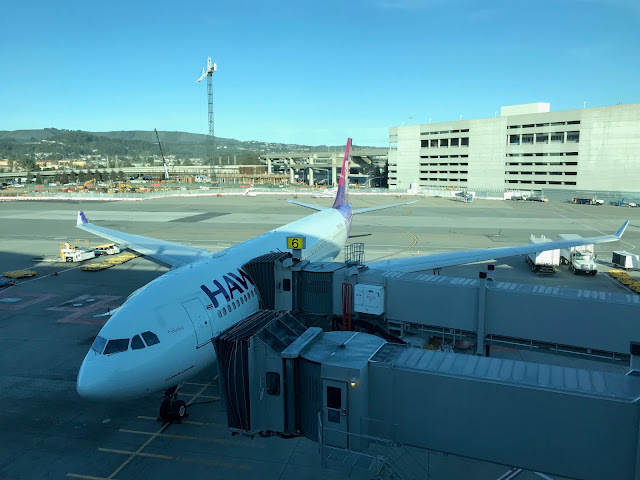 We’ve covered the flights between YYC and SFO and now here we have our review of our flights on Hawaiian Airlines between SFO and OGG. 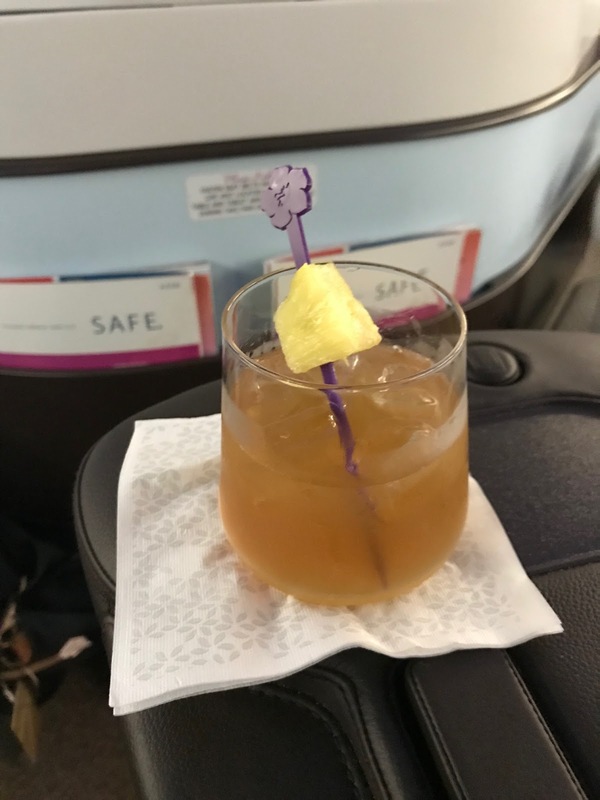 Here’s a quick recap on how we got about flying this way to Maui instead of the direct flights out of YYC. 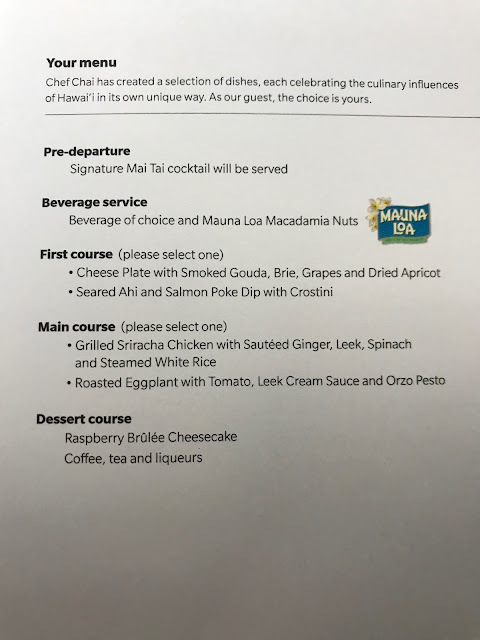 Now to the actual review of Hawaiian Airlines First Class! 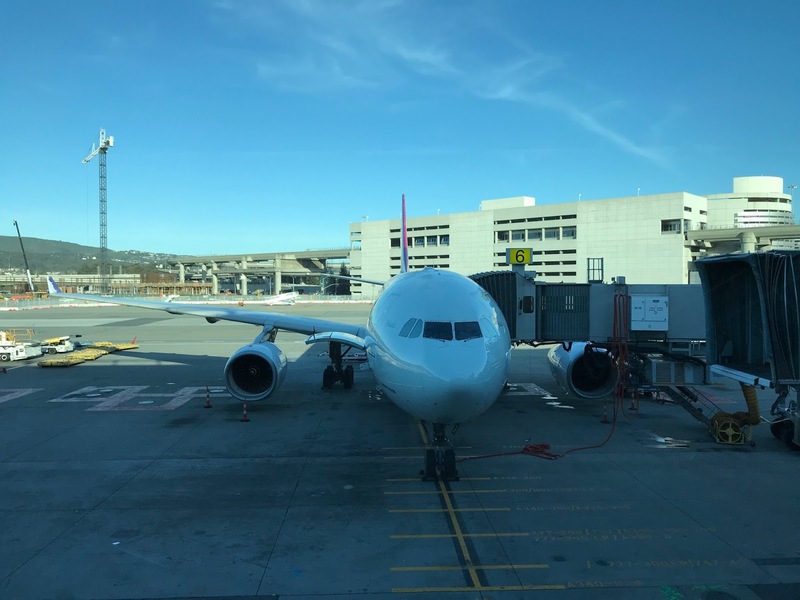 We made sure the flights we booked on Hawaiian were on their relatively new Airbus A330 aircraft as they feature a newer business class cabin with lie flat seats. You can find these planes on the more popular routes between the US and Honolulu or Kahului out Los Angeles, San Diego, San Francisco, New York and more. I checked most of the west coast cities for our trip and SFO priced out the best for Easter break. 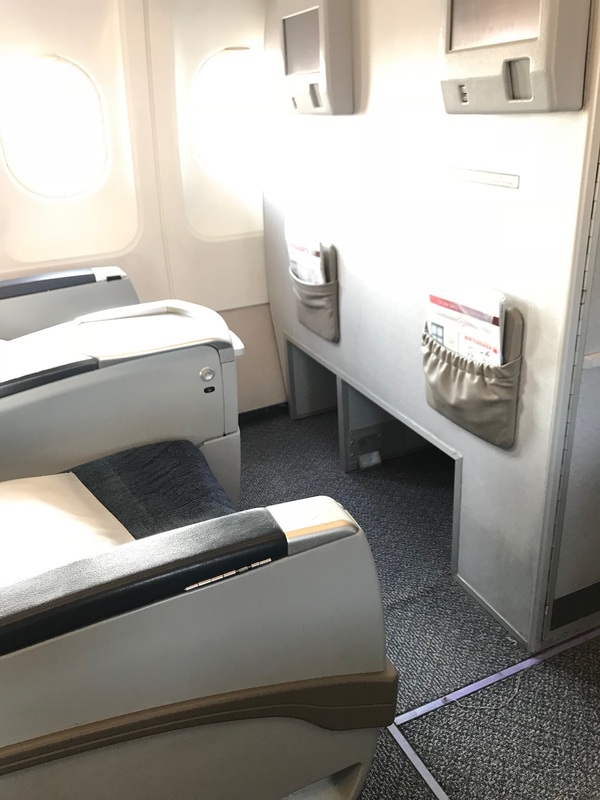 For flights out of the U.S. they classify the cabin as First Class while on their International flights to Australia, Japan etc. 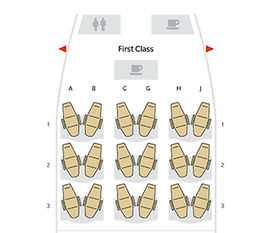 it is classified as Business Class. Hawaiian Airlines does not have a lounge in SFO but with most of their departures being mid-morning and operating domestic flights you don’t have to arrive super early and really don’t need to hit up a lounge. Hawaiian does depart from the international terminal which means you could use the Air France KLM Lounge via Priority Pass. The flight was scheduled to depart at 10am and boarding started at about 9:35am with those in First Class getting priority boarding. 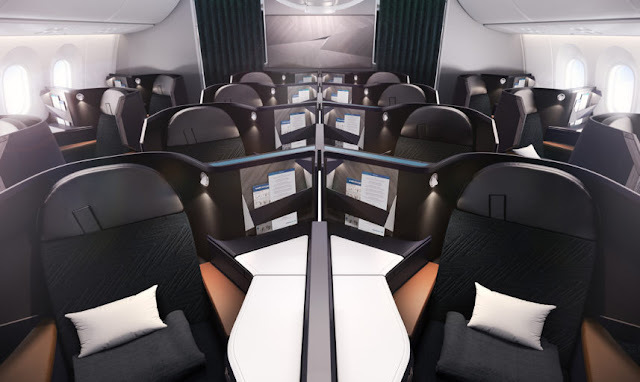 They board from door L2 so it’s a left turn to the premium cabin that has 18 lie flat seats. Since Hawaiian is primarily a leisure airline and there are not many single travellers flying the airline, the business class cabin is laid out in a 2-2-2 fashion for couples and families. Perfect for us as we are a family of four and for the flight there and back we grabbed seats 2CGHJ. Almost as soon as we were seated we were offered drinks - a Mai Tai or POG. Both awesome options and very Hawaiian. 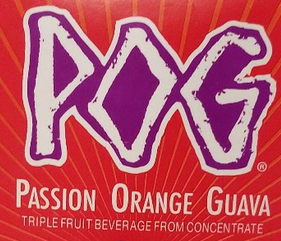 On the flight there we started with POG, for those who have not been to Hawaii, POG is a staple juice of Passion, Orange and Guava juice. For the flight back we took the mai Tais and also tried POG with Vodka and neither drink disappointed. 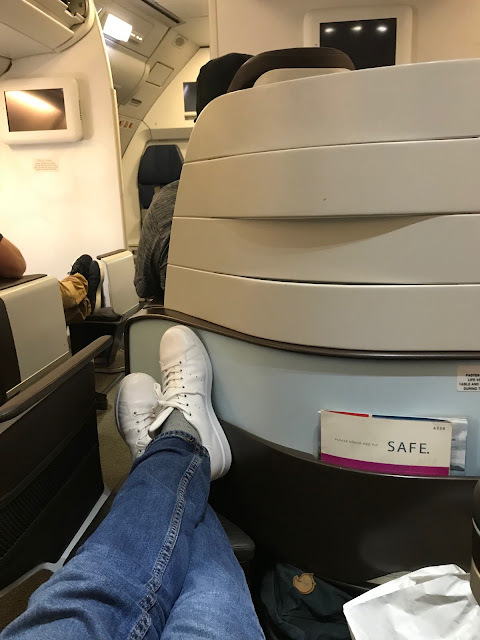 The seats themselves were quite comfy but I did find that when laying flat the space for the feet was quite narrow and I actually could not keep both feet beside each other comfortably, I had to cross them to fit better. 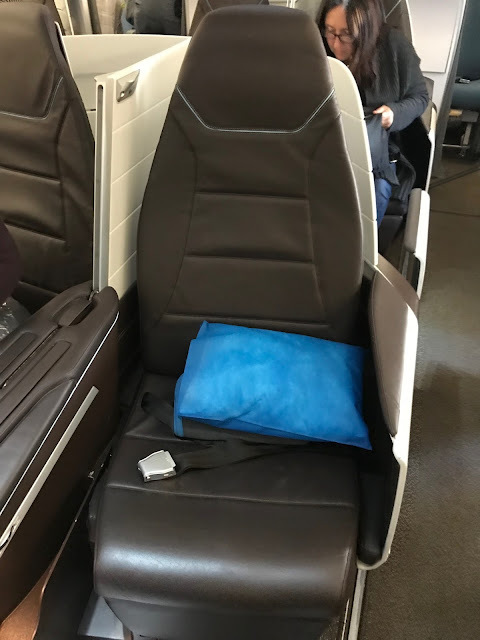 Seats pairs have a privacy divider that can be extended up should you be traveling alone and don’t want to interact with whomever may be sitting beside you. A pillow and blanket were provided albeit both were small and light, more like something you would find in Economy class. I also found the storage at the seat to be on the small side, you do have an area under the seat in front of you which I stuffed my laptop bag into but a good quarter of it was sticking out. It best fits a purse or something small like that. 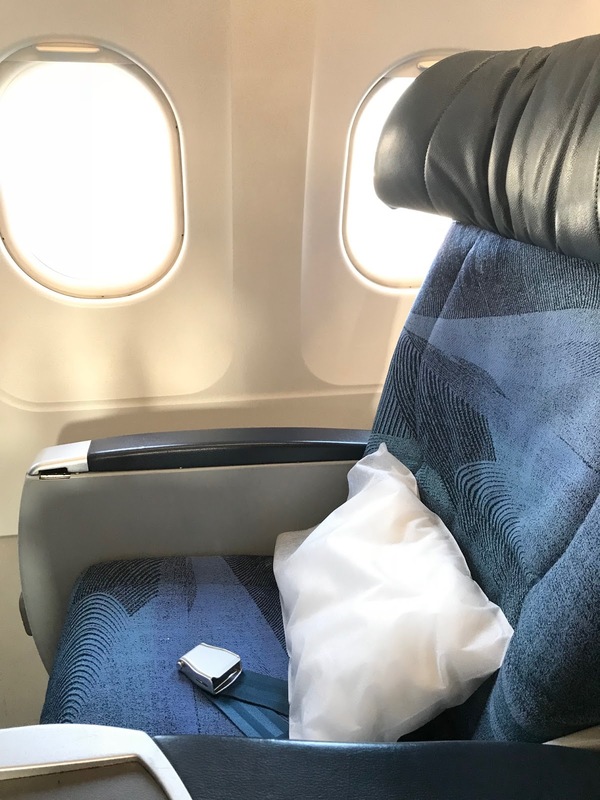 Each seat had a small personal reading LED lamp in addition to overhead reading lights, small storage on the side of your seat which was perfect for electronics or water bottles as well as 110V/USB plugs to charge electronics. 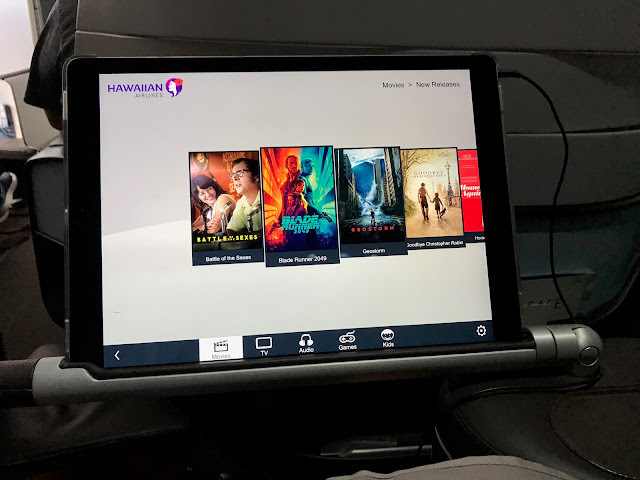 For in flight entertainment each seat has a retractable arm to which the flight attendants come by and place an Apple iPad that’s loaded with TV shows and movies. Overall the selection was OK - not a ton of new releases but more than enough content for the 5 hour flight. 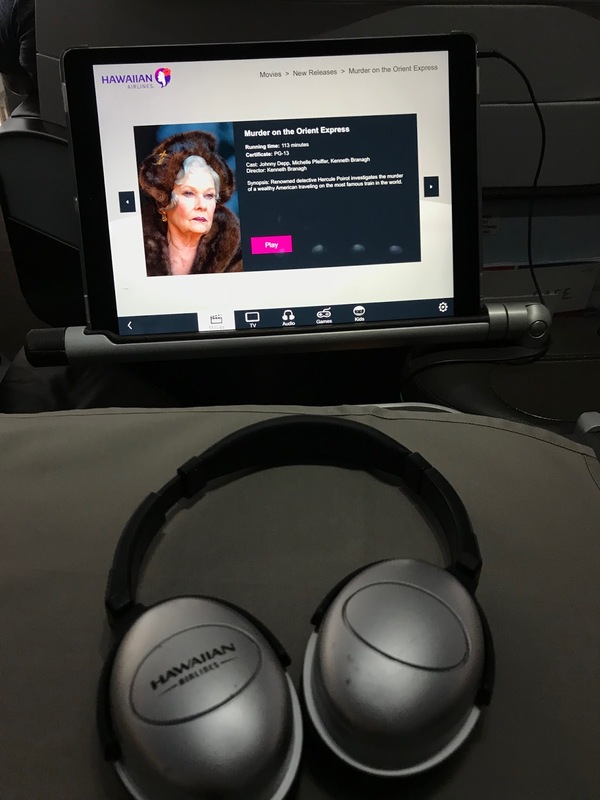 You can choose to use your own headphones or use the noise cancelling headphones provided at no cost. Bose they are not, but overall quality wasn’t too bad. Should your iPad get low on juice the airline does provide charging cables to power them up. 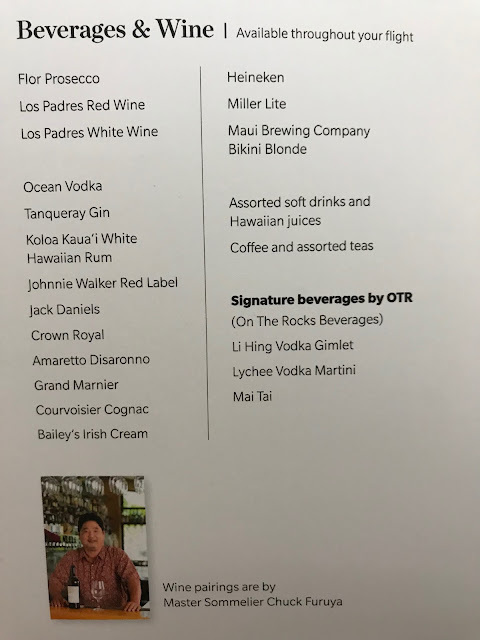 Shortly after take off the first beverage service starts and as I mentioned above, in reality you have beverage service for the whole flight - the only difference with the after take off service is the addition of Mauna Loa Macadamia nuts. They are another Hawaiian staple and delicious to have alongside your drink! Based on the menus the food for first/business class is developed by top Hawaiian chefs including one of our favourites from Top Chef Sheldon Simeon. 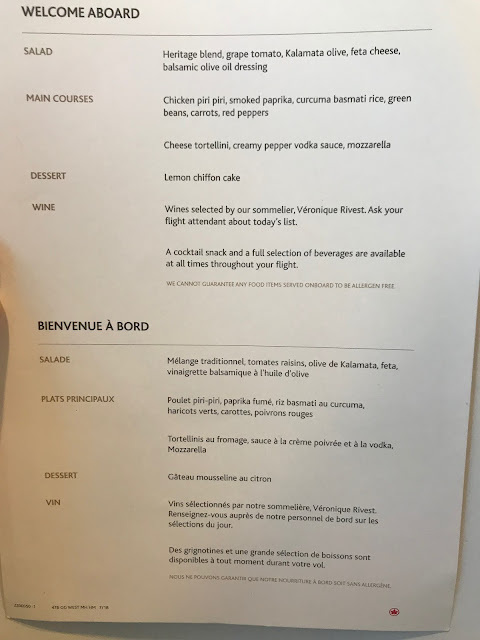 Alas our flight did not have any of his dishes. 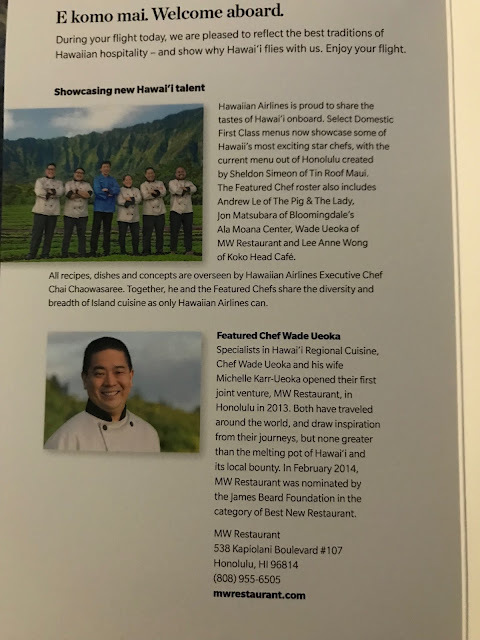 For our flight to Maui it had dishes by Chef Chai. I started with the cheese plate - can’t really mess that up and it was good. Our older daughter choose the Ahi and Salmon Poke which she enjoyed. All four of us chose the Sriracha chicken dish as our main. It looked better than it was as the chicken - as seems to be common when you fly - was rubbery. The sauce was OK but it really needed a gallon of it to help the poor chicken. The flight back featured food by Wade Ueoka. 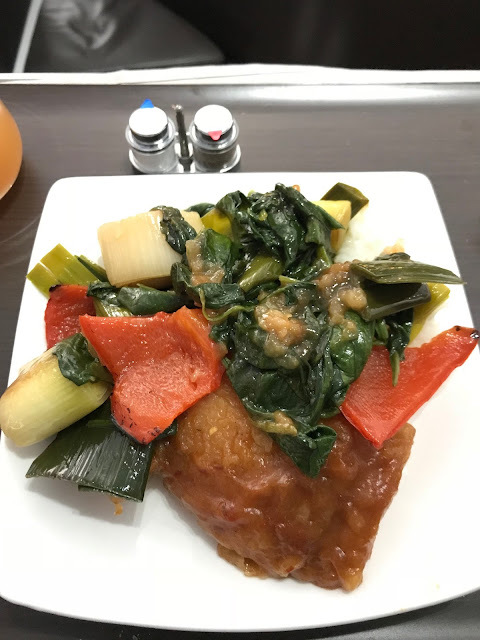 We choose the Jidori chicken salad and the Meatloaf. These were a lot better than the food on the way Maui - edible and quite tasty. 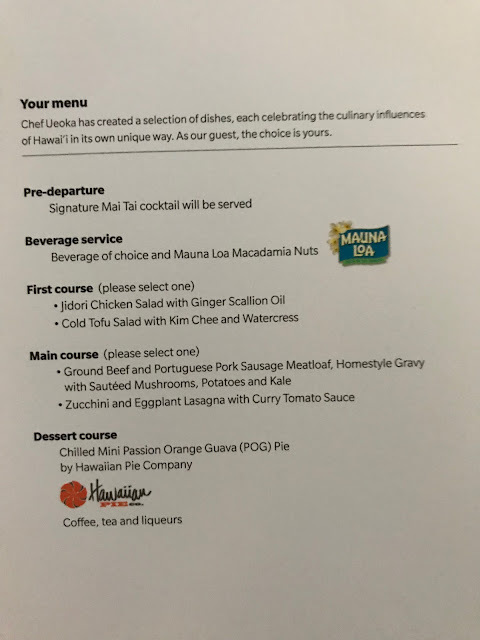 The POG pie was really good - one of the better deserts we have onboard in sometime. 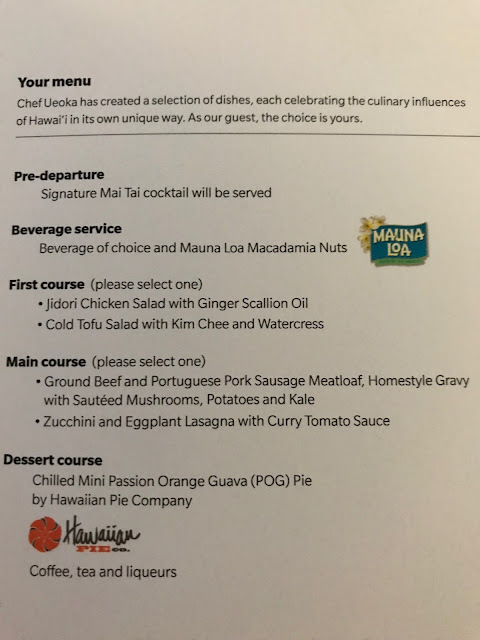 After experiencing Hawaiian's premium class for the first time we may never fly direct again to the Islands (unless AC brings back an Internationally configured plane or WestJet puts their 787's on the route, both of which are highlight unlikely now) as we really enjoyed the flights. 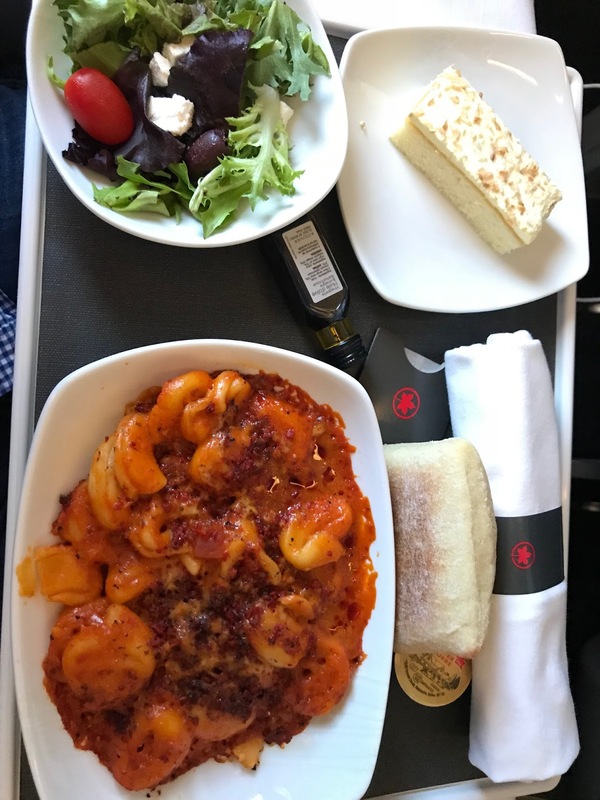 The service, the comfort and overall feel of the flights were great. 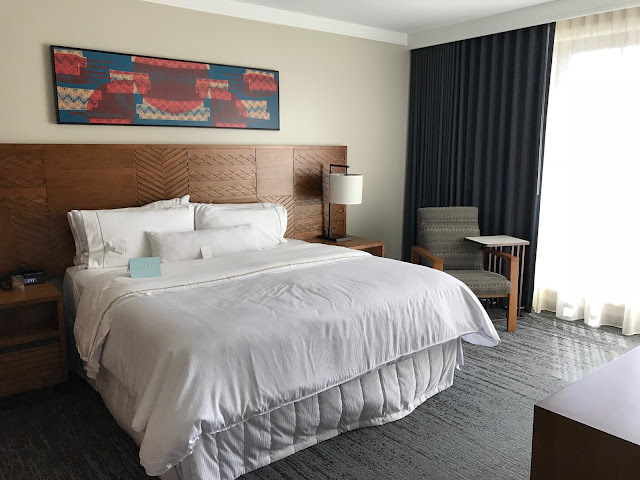 Sure it's not direct but the overnight stays add extra adventure to the travels and we have already talked about which city we'd connect in next time - so far San Diego is winning! For most Canadians, if you don't live near Vancouver, Edmonton, Calgary or Toronto you are going to have connecting flights to get to Hawaii so this is something you can look at as many don't consider this option. 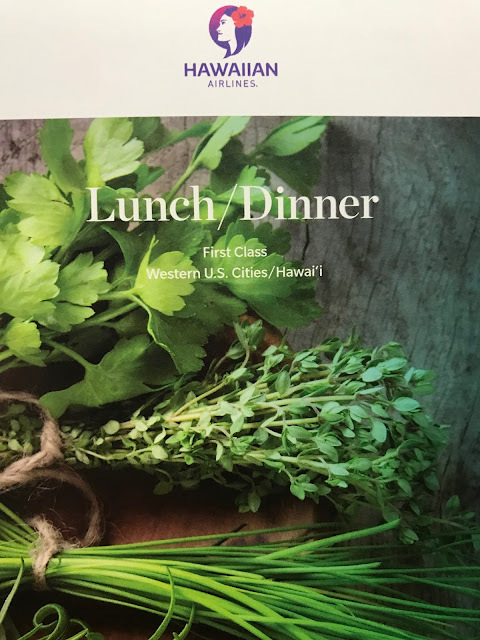 If you are looking for a fun, Hawaiian themed and relatively well priced premium experience flying to Hawaii I would most definitely recommend flying Hawaiian Airlines on their A330's to the islands!